When you're putting together your strength-training routine, include the lat pulldown to target your back. This move primarily activates the latissimus dorsi, the broad muscle that covers the back of the ribs and wraps partially around your lower waist. Although the lat pulldown seems relatively simple, it's often done in a way that doesn't maximize its muscle-building potential. Consider how grip width, grip position and the direction of the bar affects the muscles used. What Is the Lat Pulldown? 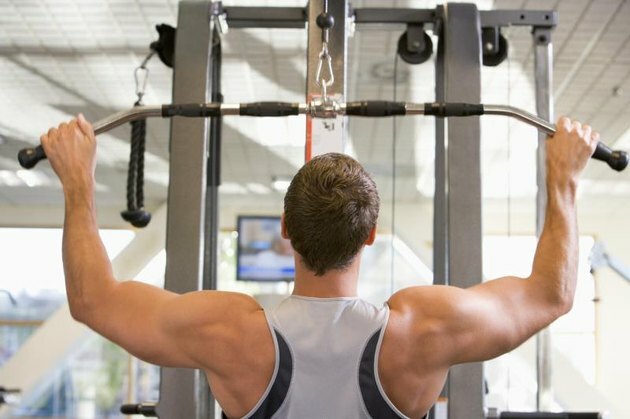 You've probably seen the lat pulldown machine at your gym. It's a freestanding machine or an attachment on a cable complex featuring a padded seat, thigh supports and a long bar hanging from an upper rod. You sit on the seat, hook your thighs under the support pads and pull the bar down to your neck or chest. It's called the "lat pulldown" for a reason it activates the lats, the nickname for the latissimus dorsi. Broad and thin, this muscle is intrinsic in all sorts of pulling movements, including pull-ups and swimming. In everyday life, you might use the lats when you bring a heavy item down off of a shelf. The lats also swing the arms as you walk or row and assist when you cross your arms in front of your chest. The lat pulldown uses other muscles of the back for assistance. As you pull the bar to your chest, you work the rhomboids (both major and minor), which are responsible for scapular, or shoulder blade, retraction; the trapezius (lower and middle), which also helps you pull the scapula down and move the arm up; and the teres major, teres minor and infraspinatus, the muscles of the rotator cuff. The posterior deltoid is techinically a muscle behind the shoulders, but it also offers assistance during the lat pulldown and contributes to the appearance of a strong, V-shaped back. A smaller muscle, called the levator scapulae, stabilizes the back and sides of your neck as you pull down the bar. While curls are still the winner when it comes to building big biceps, these muscles of your upper arm also play a role in the lat pulldown. The grasping and pulling of the bar activates your forearm muscles, the brachialis and brachioradialis. The lat pulldown also stimulates your pectoralis minor, the smaller and deeper of your two chest muscles. Finally, a lat pulldown uses your triceps to stabilize your elbow joint as it bends and extends. The lat pulldown machine features a wide bar that you could technically grip in many ways: wide, narrow, medium, overhand or underhand. Because the goal of the exercise is to maximize activation of the latissimus dorsi, it makes sense to choose the grip that best achieves this goal. Pulling the bar down in front of the face and neck is most effective in activating the lats as compared to pulling the bar behind the neck, showed a 2009 study published in the Journal of Strength and Conditioning Research. It's also a safer way to do the exercise. 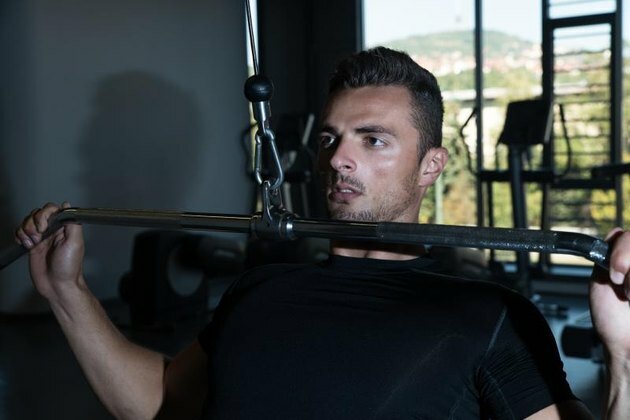 You'll also want to hold the bar with an overhand grip, as this also ensures maximal activation of the latissimus dorsi, showed another study published in the Journal of Strength and Conditioning Research in 2010. No need to worry too much about how widely you grip the bar, though. A narrow, wide and medium grip all seemed to notably make the lats work, researchers found in a study published in the Journal of Strength and Conditioning Research in 2014. While a medium grip did offer a slight increase in muscle activation in most of the muscles used for the lat pulldown, this stimulation wasn't so much greater than other grips as to really matter when you're trying to build your back. What Does a Straight-Arm Pulldown Work?